Parker leather strops are a necessity for any straight razor shaver. 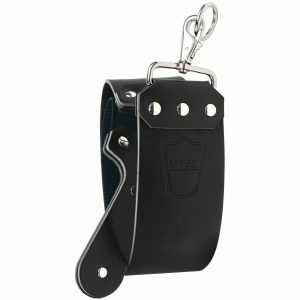 It is proudly American made with high quality grade Latigo leather which has been cured for the perfect draw. This strop is accompanied with a twin strop made of webbed polypropylene fabric for polishing or drying your razor. Both strops are joined with modern hardware and durable paddle handles that allow you to create the perfect amount of tension for your straight shave.